John Deere is building on its lineup of SmartGrade crawler dozers with the integration of the machine control offering on the 750K and 850K models. John Deere is building on its lineup of SmartGrade crawler dozers with the integration of the machine control offering on the 750K and 850K models. 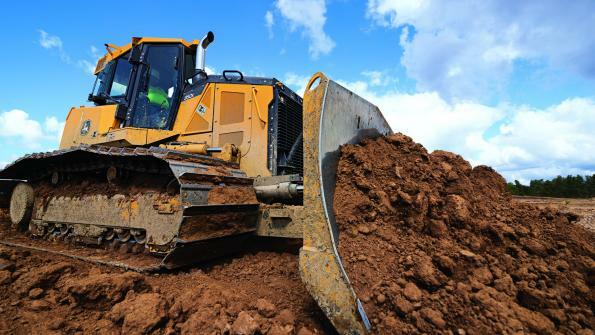 Adding SmartGrade availability on these larger machines will improve job site accuracy and quality of work, according to the company. Go here for details. The Topcon 3D-MC2 Grade Control System is integrated into the equipment. The system is fully incorporated into the machine cabin, structures and software. It delivers precise grading performance while eliminating vulnerable external masts and cables. The 750K and 850K SmartGrade dozers are easy to set up for productive earthmoving and grading tasks. Use the machines for road building, site development and building applications. The units are ready to work the instant they roll off the dealer lot. The 750K and 850K incorporate a PowerTech 6.8-L Final Tier 4 diesel engine with 165 horsepower and 205 horsepower, respectively. Both models feature Eco mode, which automatically adjusts engine power and transmission settings based on load while maintaining ground speed. This feature helps optimize fuel economy, according to the company. A feature of the integrated machine control is Auto SmartGrade. This allows the operator to easily adjust the system when moving the machine from one soil type to another, unlike an after-market system, which often requires the GPS manager to make a trip to the machine to recalibrate the system. Particularly helpful to new operators, Auto SmartGrade automatically lifts the blade over heavy loads before track slippage occurs, then returns the blade to grade. SmartGrade also limits the number of passes required, reducing the pace of wear on the undercarriage. According to the company, the John Deere SmartGrade dozer is nearly 7 percent more accurate across the entire speed range of the dozer when compared to conventional masted systems. The SmartGrade integration into the 750K and 850K dozers also allows for enhanced diagnostics. Having the ability to get the grade control system and diagnostic information over the John Deere JDLink telematics system provides useful uptime information to customers. In the video, learn the advantages of the SmartGrade Dozer and its fully integrated grade control system.